I’m often asked what is the best marketing automation platform? The truth is there is no single best solution. Rather, every solution has their place, for the right company, maturity levels, resources and needs. It’s with this in mind today Engage Digital (a MicroChannel company) is proud to announce we have become an official channel partner in Australia and the Asia Pacific region for Dotmailer, UK’s no.1 largest email marketing provider. To partner with Dotmailer was an obvious choice – its ease-of-use and ease-of-integration is in complete alignment with our strategy to provide our customers with the best of breed in Marketing Automation. Not to mention we were very impressed with their innovative technology, constant drive to improve, superior workflow and unrivalled reputation as a market leader. 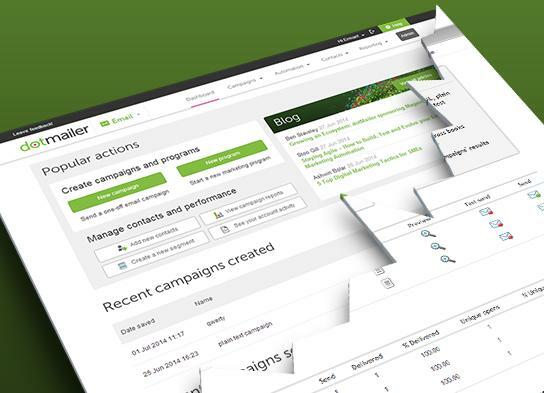 Dotmailer has been helping top brands run high-impact and highly personalised campaigns for over 15 years thanks to its simple but powerful email and cross-channel marketing automation solutions. Which is best described as “NASA technology with a Fisher Price ease of use” as its Co-founder Tink Taylor likes to remark. Indeed, their easy to use interface will allow you to easily create, automate, test and send emails in minutes, utilising transactional, behavioural and social insights to improve lead generation and conversion. The technology also offers easy integration via plug-ins into all leading CRM and ecommerce platforms including Magento, Salesforce and Microsoft Dynamics, enabling marketers to seamlessly track customer interaction. We are also pleased to mention that following a rigorous audit process, Dotmailer has recently been awarded Platinum status for Magento and is the first and only marketing platform to achieve this status globally. We truly believe that this enhanced relationship will allow us to better respond to our customers’ different needs and provide greater opportunities for them by decreasing the time it takes them to complete some tasks and allow them to focus on other important marketing activities. Headquartered in the UK, Dotmailer boasts more than 70,000 users in over 150 countries. Clients span numerous sectors and some notable names include BBC Worldwide, DHL, BP, Fujifilm, Reiss, Paperchase, Vax and World Duty Free. If you’d like to learn more how Dotmailer can help your business and complement existing marketing technologies please contact us or check out Dotmailer’s best practice guide on how to get personal with your email and landing pages.